Montgomery County was established in 1776 from the northeastern part of Fincastle County (now abolished). The county's name honored General Richard Montgomery, killed during the assault on Quebec late in 1775. At the time of its creation, Montgomery covered nearly 12,000 square miles and extended westward to the Ohio River. In 1777 the western half of Montgomery was cut off to form Greenbrier County. Following this division, Montgomery County was still immense. Its territory included all or part of the following counties: Buchanan, Craig, Giles, Pulaski, Roanoke, Tazewell, Wythe and the West Virginia counties of Boone, Cabell, Fayette, Kanawha, Lincoln, Logan, McDowell, Mercer, Mingo, Raleigh, Summers, Wayne, and Wyoming. A portion of Kanawha County was separated from Montgomery in 1788. In 1794 the boundary between Montgomery and Grayson was adjusted and the following year (1795) the line between Botetourt and Montgomery was altered slightly (a further alteration of this second line occurred in 1796) In 1808 Giles County was formed from part of Montgomery, followed by Floyd County in 1831. In 1839 another part of Montgomery was transferred to Floyd County. in 1840 a single farm was transferred back to Montgomery's control. In 1842 part of Pulaski County was given back to Montgomery. In 1849 Roanoke County annexed an adjacent portion of Montgomery lands and in 1853 part of Montgomery was added to form Craig County. Montgomery's boundaries stabilized at that point. 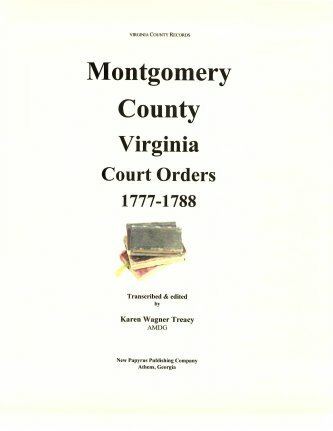 MONTGOMERY CO., VIRGINIA COURT ORDERS, 1777-1788: From Order Books 1, 2, 3 and other sources transcribed & edited by Karen Wagner Treacy. 10 1/2 x 8 1/2, viii, 333 pages, index. This work includes three volumes of Montgomery County Court Orders, which are not numbered in chronological order. Montgomery County was formed from Fincastle County in 1777. Fincastle’s records are contained in the first half each of two volumes. Montgomery County records commence sequentially at the end of Fincastle’s records, as the second half of volume 2, 1777-1782, ending with a note “The minutes from this period until August 1782 are not [ ] this office [ ]”. Volume 3 covers the period 1778-1780. Next we return to the second half of the first volume of Fincastle records, which covers 1785-1788, leaving a gap between 1782 and 1785, and an overlap between 1780 and 1782. Further complicating this picture is the presence of a completely detached portion of a minute book and docket from 1779, located in the archives of the Virginia State Library. Where is the rest of that volume? In this work the three volumes are given in approximate chronological order, with volume 2 as Part One, volume 3 as Part Two, and volume 1 as part Three. The fourth portion of this work is Additional Material, including the partial minute book/docket mentioned above, grand jury presentments, warrants and other documents pertaining to some of the cases, and the minutes, from the Draper manuscripts, of a joint session of Montgomery and Botetourt Courts for the trials of suspected Tories. I have reproduced the original spelling, abbreviations, formatting and tone of the original as best I could, although I have omitted doubled words and added some punctuation and capitalized all personal names in the minute books. The additional material I chose to reproduce as found. MONTGOMERY CO., VA 1810 CENSUS transcribed by John Vogt. 10 1/2 x 8 1/2, x, 39 pages, illustrations, maps, index. This is the first surviving census for Montgomery, since both the 1790 and 1800 censuses have been lost. A full name index is provided. Montgomery was an important and populous county in the mountainous foothills of southwestern Virginia and it was situated along the Great Road or Valley Road as it was called, which stretched from Maryland to the Cumberland Gap and beyond into Tennessee and Kentucky. This and other 1810 censuses are transcribed by the author from the original images, and while many of Virginia's censuses are available online, they oftentimes are replete with misreadings.Caveat emptor! MONTGOMERY COUNTY, VIRGINIA: THE FIRST 100 YEARS by Judge C. W. Crush. ii, 209 pages, 8½ x 11, index. Montgomery County, Va. was a "stem" county for much of the western expansion, and sets astride the great migration trails west and south. The author has transcribed original sources which elucidates the history of this county's first century through the period of the late nineteenth century. A sampling of the documentation includes personal diaries, military roles, county court records, reminiscences of past citizens of the county, and a wide range of other valuable sources. This volume is destined to be a "classic" for references to the earliest records of Montgomery and its subsequent divisions. Montgomery Co. 1815 Directory of Landowners by Roger G. Ward. 2005. 33 pages, map, 5 1/2X8 1/2. Montgomery Co. Revolutionary Public Claims transcribed by Janice L. Abercrombie and Richard Slatten.. 2005. 21 pages, 5 1/2X8 1/2. Giles, Pulaski, Wythe, Greenbrier, Buchanan, Craig, Floyd, Roanoke, Tazewell, Boone, Cabell, Fayette, Kanawha, Lincoln, Logan, McDowell, Mercer, Mingo, Raleigh, Summers, Wayne, and Wyoming Counties, plus the now extinct county of Fincastle.